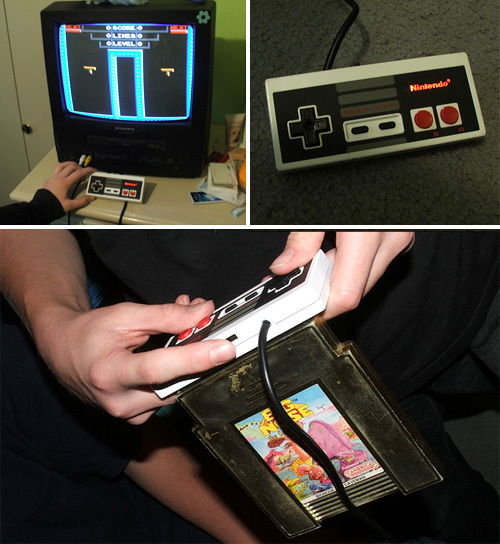 Clever Modder Crams An NES Clone Into An NES Controller | OhGizmo! By Andrew Liszewski on 07/15/08 • Leave a comment! -Came with built-in pirate games, including the 2 player version of tetris, and a level select hacked Contra, among 70 or so more games. Nearly endless supply of old-school-nes there. I didn’t even get to play every one before I gave it away, lol. -Ca(r)tridge connector on back for playing those NES games that aren’t built in. Just switch the power switch over to the left and it disables built in games, and the ca(r)tridge is playing. I wasn’t going to add this at first, but thought about how she had a weird pirate game with a guy who threw rocks, and it wouldn’t work on her blinking NES. I really wanted to play it, so thats why I added it. A bit selfish maybe, but I don’t think anyone will complain. -Nintendo logo is backlit! Looks insanely cool in real life. I’m going to do this to all my NES controllers when I can get around to it! It’s that cool. Only thing that bugs me is that one LED is too close to the logo and unblablances the light. Something only a perfectionist would notice. Something tells me if G-force found a way to produce a limited run of these Mini NES’s, he’d make himself a small fortune.